In the most comprehensive outline of the financial planning scandal anywhere, Dr Evan Jones explains why the Commonwealth Bank was never in danger of a Royal Commission being called into its systematic criminal behaviour. FOR TWELVE MONTHS, the Fairfax press has been reporting on the skullduggery at the heart of the Commonwealth Bank’s subsidiary Commonwealth Financial Planning Ltd, where another swathe of retail investors were generated whose savings were fraudulently plundered. The financial regulator ASIC was initially nowhere to be seen. Belatedly, ASIC has intruded gingerly and inadequately into the scandal, giving little comfort to the bank’s defrauded clients. A Senate Committee was established to inquire into ASIC’s negligence, and its recent report lambastes both the CBA’s predatory behaviour and lack of repentance and ASIC’s failings. However, current commentary devoted to reforming the financial planning sector misses the deep origins of the scandal, and the political impasse that inhibits a comprehensive assault on finance sector malpractice and criminality. Simply put, the last 25 years has seen constructed an elaborate financial regulatory apparatus but one staffed by ill-trained and accommodating personnel, attenuated by ‘revolving door-ism’. The political class has evolved along comparable lines. Cowardice and complacency are endemic in those who we rely on to serve the public interest in an ethical, competent and assertive manner. This piece will look at the events that led to the financial scandal, details the institutional responses and failures and then reach some conclusions and recommendations. On 4 June 2013, a regular meeting of ASIC senior personnel before the Senate Estimates Committee transcended the conventional formalities. ASIC deputy commissioner Peter Kell displeased several senators in his convoluted answer to a question. Thus on 20 June 2013, the Senate agreed to an Inquiry by the Senate Economics Committee into ASIC’s performance. The Report of that Inquiry was published on 26 June 2014. The spark that ignited the inquiry was the debacle at the CBA’s subsidiary Commonwealth Financial Planning Ltd. The spark was provided by a whistleblower trio led by financial planner Jeff Morris, beginning in October 2008. Fanning the combustion was the Fairfax press, led by journalist Adele Ferguson, with the first article appearing on 1 June 2013. The 12 months coverage by Fairfax of the issue has been exemplary. The CBA promised those nurturing a nest egg expert advice and consummate husbandry if the said nest egg was committed to CFPL’s keeping. Instead, the customers were sucked into a racket. The Senate report is a mammoth 553 pages in length. There were 474 submissions, some in multiple parts. Many submissions are designated Name Withheld or Confidential — a tangible reflection of power imbalance, skullduggery and victim fears. Kudos to the Secretariat staff who had to master the material and write the bulk of the report. The report’s scale is forbidding. However, ready access to the guts of the issue can be found in the initial 39-page submission by Jeff Morris, numbered #421 (Morris made seven supplementary submissions). Morris joined the CBA as a financial planner in April 2008 for personal reasons. He soon smelled the dead fish. Morris came with wide experience that gave him the skills to discern the internal problems and the detachment to confront and expose them. Rogue ‘advisor’ Don Nguyen, operating from the Sydney suburban Chatswood branch soon appeared on the radar. His entire modus operandi was corrupt. Fabricated client ‘risk profiles’, translated uniformly into ‘hyper aggressive investment portfolios’. Purloined client files, bribes to fellow staff to hide his procedures, false billing of the bank itself, and so on. A very rotten apple — and there were more. But this story is not about rotten apples. It is rather about the venality of the CBA itself. Nguyen was suspended in September 2008. He was reinstated in October precisely in order to quarantine his victims. Nguyen was retrenched in mid 2009 on ‘health’ grounds and given a pension. Thus, he was protected by his superiors. Morris labeled CFPL ‘nothing more than a low rent sales channel’, driven by a bonus-centred culture right up the hierarchy. The role of CFPL ‘planners’ was to shovel clients into CBA products, within the ‘wealth management’ Colonial First State subsidiary and an insurance subsidiary CommInsure, in the meantime charging fees both unnecessary (one could access CFS directly) and spurious (for non-existent advice). A lot of these clients would be ‘harvested’ (Morris’ term) from the CBA existing deposit base, who would be seduced out of their de facto preferred position of cash or term deposits. The Customer Experience (sic) section blamed the clients. Group Security was more interested in tracking down the whistleblowers. Nguyen’s replacement was similarly directed to quarantining Nguyen’s victims. Meanwhile, Head Office had sent in a huge team, under the rubric ‘Project Hartnett’, to clean up or reconstruct client files. Morris made offers to the CEO and the CBA Board to fill them in, but his offers were declined. The bank aimed to isolate each client victim and compensate them as little as possible — preferably nothing. Confronted with evidence that senior management were implicated, Morris et al faxed a document to ASIC on 30 October 2008. Receiving no immediate response, they followed up with emails. At some stage ASIC claimed to be investigating the matter, but they hadn’t claimed any files. In April 2009, a document discovered accidentally confirmed the complicity of CFPL senior management. Contemplating that ASIC were not merely incompetent, but perhaps too ‘palsy’ with the bank, the whistleblowers decided to go public. Thus, a series of articles were published in the trade journal Investor Daily in May-June 2009. One article names Nguyen, which sets in train the resignation of Nguyen. But there is no response at ASIC. The whistleblowers eventually have a meeting with ASIC staff in February 2010, 16 months after Morris et al had raised the alarm. ASIC declines Morris’ offer to help decipher the CFPL files. In March, ASIC demands CFPL files but gives the bank two weeks to produce them. By this time, the bank has long been massaging the files. Morris notes that the CBA has never produced a single original document, only photocopies and ASIC hasn’t demanded any. Belatedly, the CBA and ASIC contrived an ‘Approved Compensation Scheme’ in November 2010. ASIC claimed that the CBA demonstrated ‘a cooperative and consultative approach’. A reflection of the CBA’s brutal approach was its refusal to negotiate with the client if the latter wanted their own adviser. Yet ASIC left the administration of the scheme to the CBA. … ASIC did virtually no investigative work of their own but basically just added what CFPL gave them to what the whistleblowers did. I have no doubt that a proper investigation would reveal at least 100 current or former planners of CFPL [of a revolving population of 750] whose clients should be compensated for dodgy/and or just plain incompetent, advice. First to the good part. At this stage, the committee's confidence in ASIC's ability to monitor the CBA's implementation of its new undertaking regarding the compensation process is severely undermined. Furthermore, the CBA's credibility in the CFPL matter is so compromised that responsibility for the compensation process should be taken away from the bank. The committee considered five options to finally resolve the CFPL matter. But, given the seriousness of the misconduct and the need for all client files to be reviewed, the committee believes that an inquiry with sufficient investigative and discovery powers should be established by the government to undertake this work. To resolve this matter conclusively and satisfactorily, the inquiry would need the powers to compel relevant people to give evidence and to produce information or documents. 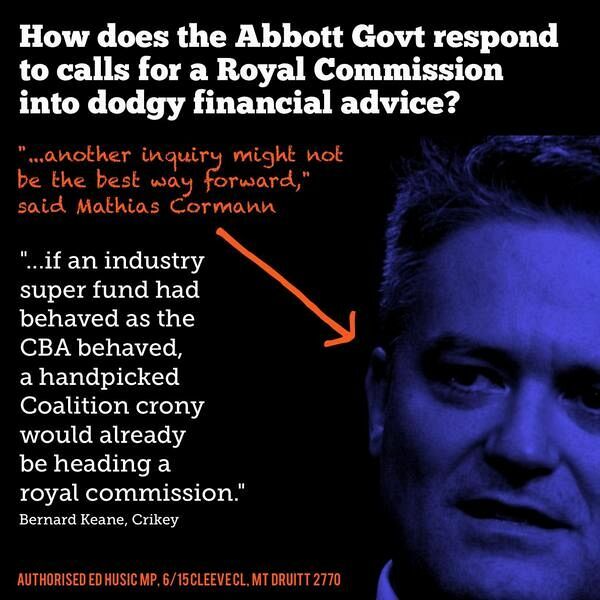 The committee is of the view that a royal commission into these matters is warranted. The report provides substance behind this summary position. But the report is a disappointment on some key fronts. The Committee notes that no investor has the right to be protected from loss per se. But consumers have every right to expect that ASIC should fulfil its mandated responsibilities. Indeed, ASIC was expanded from its forerunner, the ASC, for precisely this purpose. The major fallout in Australia from the 2008 GFC has been the huge losses incurred by family retail investors with their life savings, disappeared within a wide range of spiv investment schemes — a list that included some operated by Australia’s formally most respected financial institutions. ASIC has manifestly failed these people. In spite of its length, the Report concentrates on ASIC’s failings in only two arenas — the CBA’s CFPL debacle (the catalyst for the Inquiry itself) and the banks (and brokers') dubious, and often predatory, retail mortgage lending practices. With respect to the CFPL issue, coupled with the CBA’s lesser subsidiary Financial Wisdom Ltd, the CBA’s and ASIC’s cynical response to the Senate Committee in their misleading submissions tipped the normally sedate Committee over the edge into its Royal Commission recommendation. 12.27 The committee is of the view that a judicial inquiry is warranted. The CFPL scandal needs to become a lesson for the entire financial services sector. Firms need to know that they cannot turn a blind eye to rogue employees who do whatever it takes to make profits at the expense of vulnerable investors. If this matter is not pursued thoroughly, there will be little incentive for Australia's major financial institutions to take compliance seriously. Apart from the two ‘case studies’, the Committee report diverts to an exploration of the functioning of ASIC's ‘External Dispute Resolution’ schemes, the Financial Ombudsman Service and the Credit Ombudsman Service (Chapter 7). Given the parameters of the report, even FOS is discussed purely from a retail customer perspective. The report is much too kind to FOS. It does recommend that the dispute value limit for FOS treatment and its compensation limit be increased (marginally), but it is weak on the six-year ‘statute of limitations’ limit. Worse, it accepts meekly everything proffered by senior managers Shane Tregillis and Philip Field, who unstintingly defend all current arrangements — including the funding arrangements, the claimed effective analysis of systemic malpractice (a joke), the non-naming of financial institutions found wanting, and the existing value limits on dispute handling and compensation. The Committee had submissions from financial service provider victims highlighting FOS’ lack of independence. I digress to one of the original complaints with regard to Bank West and note that when the question of the offer made by Bank West as supported by written communications from Mr David Veal, Bank West's response was something along the lines of "… Mr Veal is no longer with our bank and therefore anything he has said is not relevant ..." This was and still is a critical point which your office conveniently chose to ignore. This alone brings into question your independence. It is not acceptable that your office continually side [sic] with the FSP and deliberately withhold [sic] evidence and information which is critical to our claim and or simply dismiss things as being out of your procedures and or jurisdiction. Your office needs to stand up and take responsibility for what is lodged with you and deal with it in a truly independent and unbiased manner. The fact that you are funded by the Banks is in itself questionable and your blatant bias in these matters is unconscionable. I can attest that this victim’s experience with FOS is not exceptional. FOS puts victims through a Kafkaesque hierarchy of multiple respondents, multiple layers, long delays, artificial deadlines for the victims but not for the guilty party or themselves, with FOS’ frontline staffed by ignorant youngsters. The Committee has failed to confront the manifest dysfunctionality and complicity of FOS (on all but minor complaints), and to make strong recommendations accordingly. A brief word is warranted on Trio Capital. This scandal is mentioned in passing several times in the report, not least in Appendix 5 where some key past ‘enforcement’ actions of ASIC are usefully summarised. The Committee feels justified in passing over this and other issues because of coverage by other inquiries or reports. But the Trio Capital case deserves special mention. Trio Capital was conceived and executed purely as a criminal scam. Trio’s Australian head, Shawn Richard, admitted guilt and was gaoled. But, as Trio Capital activist Paul Matters highlights, Richards was pursued by ASIC under the Corporations Act rather than the Crimes Act, with the maximum gaol sentence under the former being five years. Richard is now free after two and a half years in prison. Yet the Wollongong community, in particular, remains devastated by the losses. ASIC has dropped the case, claiming (ludicrously) that there was ‘insufficient evidence’ to pursue the American-based mastermind. The inaction on Trio Capital is a significant indictment of the gutlessness of ASIC and of the Australian Federal Police. There is nothing – zero, zilch – on bank corrupt practices against SME and family farmer borrowers. The Committee flagged its preoccupation with the CFPL issue, but the Committee missed the opportunity to reinforce its case. The report cites my submission (#295) several times, but omits to pursue the substance behind the sentences cited. In particular, there is not a single mention of the CBA’s BankWest scandal. This same Committee’s previous inquiry (The post-GFC banking sector) was instigated by the BankWest scandal, but the Committee’s Report bizarrely ignored the issue, a cynical and cowardly process that I outlined in an April 2014 article. The BankWest scandal has thus been doubly interred. If the Committee had acknowledged the CBA’s (and other banks’) corrupt practices in the SME/farmer domain and ASIC’s comprehensive inaction, in spite of its legislated mandate, the Committee could have enhanced its argument regarding ASIC’s failings with respect to the report’s designated emphases and enhanced its leverage regarding the failings of ASIC. ASIC’s negligence and complicity is, thus, more comprehensive and profound than that proposed in the Senate report. If the media is readily covering the report’s findings and implications, the report’s silence on SME/farmer malpractice facilitates an ongoing non-coverage by the media of this latter issue. This arena of dense corruption simply ceases to exist — by construction. Worse, by ignoring the SME/farmer arena in this report, the Committee effectively ensures that ASIC’s complicity will not merely not be exposed in the immediate future but will, effectively, be further legitimised. What does this financial planner imbroglio mean? What is the problem? ‘CommBank findings mean banks must do more to regain trust in planners’. Collett is a competent and ethical columnist, and he does highlight the structural conflict of interest built into bank-employed financial planners. But the problem is not going to be solved by better training of financial planners and signing on to a industry ‘code of practice’, pushed by the Financial Planning Association. No-one is asking the big questions. How did we get to this parlous situation? How does one eradicate the structural conflict of interest? What and who are the forces inhibiting substantive reform? And so on. The backdrop to the malaise should be self-evident. It started with the comprehensive deregulation of the finance sector, unleashed by the 1981 Campbell Report. No-one then in authority thought of how to generate a corporate culture for this socially vital sector, in a backdrop of increasing global integration, that would continue to serve the public interest. Instead deep veins of both incompetence and venality quickly developed within a cowboy mentality that suffered no internal restraints — classically embodied in the 1980s foreign currency loans scandal. With respect to the CBA, in particular, this trend is outlined in my March/April 2012 series: ‘The Dark Side of the Commonwealth Bank’, here, here and here. Thus the current failings of the CBA have deep roots and have been long in gestation. They are not an aberration. In the crucial transition period to a new regime during the 1980s, the pundits crudely offer up ‘competition’ as the universal elixir. The prescription was, of course, always mythical. But no-one in authority took competition seriously anyway — least of all the competition regulator. Through the process outlined here and here, the rise of the Big Four – through a long process of amalgamation (coupled with demutualisation and privatisation) – produced the most protected and profitable cartel in global banking. The rush to amalgamation transcended banking per se. The law of the jungle prevailed. The trading bank, traditionally a narrow specialist institution dealing in short-term liabilities (deposits) and short-term assets (overdrafts), in octopus fashion became the allfinanz conglomerate that we enjoy today. The narrow talents within the trading banks were never enhanced commensurately. The separation of banking and insurance disappeared. ‘Wealth management’, launched on a sea of superannuation and retirement savings, was unthinkingly integrated into the mix. The 1997 Wallis Committee and Report, without opposition, legitimised the package. We arrive at a situation in which everyone who matters is committed to the current dysfunctional structure. To step back and unwrap the package would involve an inevitable excommunication from the Club of Respectability. Thus the present impasse and pursuit of ephemeral ‘solutions’. Thinking laterally, how about a clean separation between banking and wealth management, with divestiture forced upon the banks? The structural conflict of interest would be thus readily addressed. Not the whole solution, but a good start. Alas, those in authority or who command ‘respect’ cannot see the obvious remedy. In short, the problem is not rogue or poorly trained financial planners. The problem is the system itself. And it is unlikely that that system will be questioned in its essence by the current Murray Financial System Inquiry because, to date, its Chairman David Murray has been an integral component of the process that has delivered us to the present impasse. Has the CBA turned over a new leaf? CBA CEO Ian Narev has ‘unreservedly apologised’ to CFPL victims. But these are crocodile tears. The CBA consistently tried to bury CFPL victim complaints and to pay as little compensation as it could get away with. All of the CBA’s actions for the recent past point to a consistent strategy — dig in, and never admit wrongdoing. The CBA is the unrepentant corporate Alpha Male. Nobody amongst senior management has fallen on their sword or been sacked. The CBA Board is silent, inactive and complicit. The CBA is still trying to brush aside unfinished business with Storm Financial victims. The CBA is still brutally attempting to destroy on a case-by-case basis the hundreds of BankWest customers that it defaulted after the BankWest takeover. The CBA settled with BankWest victim Rory O’Brien in May because of the probability that it was going to lose in court, thus preventing the disclosure of incriminating evidence and the establishment of an ‘adverse’ legal precedent. Even then, the CBA ludicrously claimed the settlement to be a vindication of its stance, claiming that it had nothing to hide on the nature of the BankWest purchase. Well why then has the CBA not disclosed fully the BankWest purchase terms? Finally, the CBA is still ruthlessly defaulting and/or pursuing through the courts individual SME or farmer victims of its own lending managers, or those of its BankWest subsidiaries.